Score up to 36 tests per minute, either as a standalone or connected test scoring machine and get immediate feedback. The iNSIGHT 4ES and OpScan 4ES scanners with the SelfScore option let you score tests and quizzes—and see the feedback immediately. Score up to 36 tests per minute, using any of a wide selection of answer sheet forms designed to meet your testing needs. With a single pass, score and read answer sheets for tests containing up to 200 questions. As forms are scanned, the scanner prints the number of correct answers, letter grade and the percent correct on each answer sheet. Use the “mark” option to print the correct answer or an “X” next to each incorrect response. 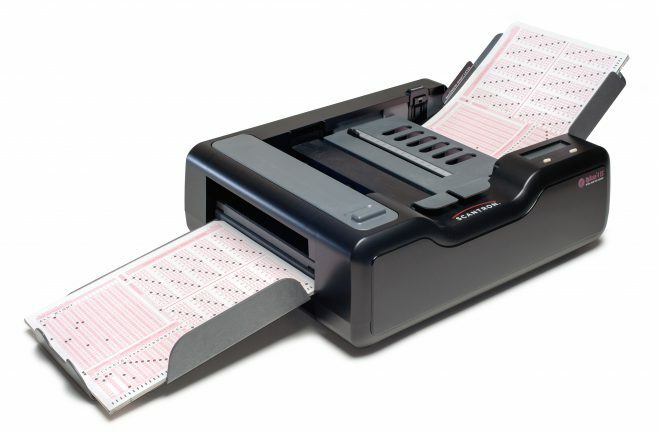 As you score the answer sheets, the scanner also collects and temporarily stores the results. After you score all the test answer sheets you can pass a special item analysis, frequency distribution, or class roster results form through the scanner to view group results. These forms show the number of tests scored, an item analysis, group average score, individual scores, and frequency distribution. Weighted performance assessment is also available. Both the OpScan 4ES or iNSIGHT 4ES with SefScore include a Scantron Score emulator to support scanning Test Scoring machine forms.